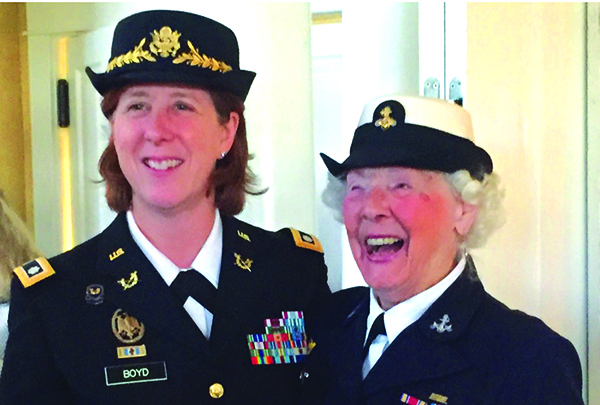 Lt. Col. Judy Boyd, U.S. Army (left), with honoree Jane McCauley, former Petty Officer 1st Class, U.S. Navy. Williston residents Sarah Corry, Cynthia Coy, Betty Packer and Susanna Pratt, along with members of the Green Mountain Chapter of Daughters of the American Revolution, hosted 23 service members and veterans from the Army, Air Force, Navy and Marines on Saturday, Nov. 5. This number included 10 veterans of the Vietnam War. Certificates of appreciation were distributed to each guest, and a lapel pin issued by the Department of Defense was presented to those who had served in Vietnam. Nationally, the DAR is making an effort to honor the men and women who served in Vietnam on the 40th anniversary of the end of U.S. military involvement in Vietnam. One honoree in attendance was Harold Bergeron of Essex Junction, who at 101 is Vermont’s oldest living veteran. He was a corporal in the U.S. Army while being transported to the Battle of the Bulge on Christmas Eve, 1944 on the ship Leopoldville. During this mission a German U-boat torpedoed his ship. Over 700 men were lost. Bergeron has received the Bronze Star, a certificate of merit and the French Foreign Legion Medal of Honor. The sinking of the Leopoldville was kept secret for many years, but readers may learn more about it at: nww2m.com/2014/12/70th-anniversary-of-leopoldville-troopship-disaster/ or armed-guard.com/leopold.html. Jane McCauley, 95, was also honored for her service in the U.S. Navy during WWII. She worked with Sen. Jim Jeffords, also a military veteran, to have a portion of I-91 named the “Women Veterans Memorial Highway.”.The keynote speaker was Marie Milord, herself a military veteran, who has been the supervisor of the South Burlington Veterans’ Center since 2012. One of 300 such centers nationwide, it offers free services to veterans and their families. It is open Monday through Saturday, and has recently relocated to 19 Gregory Drive, Suite 201, South Burlington. DAR provides volunteer services for our nation’s veterans while they are cared for at VA health care facilities and Chapter members were thanked for donating items each year for use by the veterans at the White River Junction Veteran’s Hospital. The Vermont DAR is a service organization open to any woman descended from an individual who aided the American cause for freedom during the American Revolution. Vermont Daughters support the DAR mission by promoting patriotism, preserving American history and securing the future through educational opportunity for children. Betty Ann Andrews is the Vermont chair of Service to America and a member of Daughters of the American Revolution. The DAR invites inquiries regarding membership. Please contact Karen Mayer for information at myr1129@cs.com.